Amazon: Alpha Armur Insulated Stainless Steel Water Bottle Just $9.59 (Regularly $14.99) – Today Only! 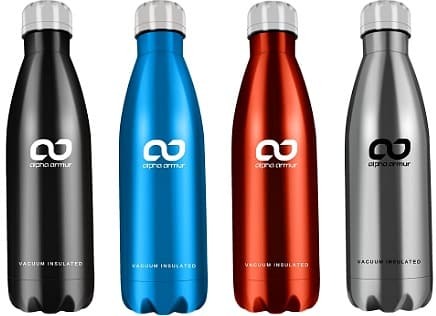 Head to Amazon.com where today only you can snag this highly rated Alpha Armur Insulated Stainless Steel Water Bottle for just $9.59 (regularly $14.99) with FREE Super Saver Shipping! This water bottle can keep drinks hot for up to 15 hours and cold for up to 20 hours, condensation free. It also has a wide mouth opening for easy refilling and cleaning or adding ice to your drinks. There are lots of colors to choose from.